I struck out the other morning for Coffeehouse Northwest (CHNW), one of the leaders in Portland’s single-origin espresso movement. I was confident that I was going to drink some good espresso and learn more about coffee, which is something that I would not have guessed from its appearance. The first time I saw the café, I was walking along Burnside and had just passed a bunch of taverns, so I didn’t give it much credit as a café. I wrote it off as just another Burnside dive. I was grossly mistaken. Fortunately, Brandon Arends corrected me. The people inside Coffeehouse Northwest are very knowledgeable and passionate about their coffee. When I got to CHNW, I asked about the espressos “on grind.” The barista told me that they had two—both single origins. The first was from Buena Vista, El Salvador (I missed the roaster’s name). The second was also from El Salvador, but it was from Finca Malarca and roasted by Ecco Roasters in San Francisco (I wish that all cafés had a board or at least a piece of paper with the name and description of the coffees on grind for the day. It would make my job easier and it would help transmit the information better to coffee junkies like myself ). I told him I wanted to try both so that I could compare the two. Learning about coffee is a never-ending process and drinking the espressos one after the another would give me a good comparison. One of the cool things about CHNW is that if you order two espressos, they only charge you $3. Normally, each espresso would be $2 each. A dedicated espresso drinker like myself really appreciates this. I had a cold that day, so I was worried about being able to taste the flavors, but my sense of smell was still strong enough to pick up some interesting things. The first thing I noticed on the first espresso (pulled at 24 seconds on the Synesso, according to my barista) was that the crema was very tart, almost sour. As I drank down a little farther, the coffee was much sweeter. I also tasted some chocolate notes that my barista said should be there. When I added sugar, flavors filled my mouth. There was definitely acidity present, but I wasn’t able to ascribe it to any particular fruit. After an hour in the café, I went back to get my second espresso. It was quite different. The crema was very nutty, almost like peanuts. When I drank a little bit deeper, I wasn’t getting much more than a toasty, slightly smoky flavor, but then suddenly out of nowhere, a burst of fruit hit my taste buds. After another sip or two, I identified the flavor as cherry. It was a sweet, bright fruitiness without much tanginess. It was very different from the other El Salvador coffee and very good as well. Overall, I think Coffeehouse Northwest deserves its reputation as one of Portland’s better cafés. 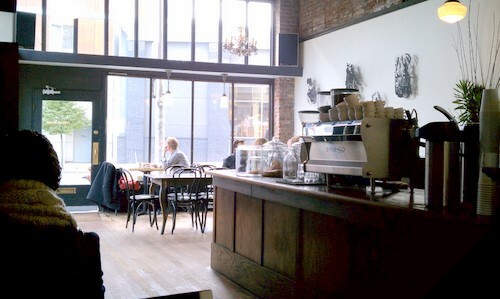 If I ever lead a tour of Portland’s best cafés, I would make it a priority to take people there. The café space is straight-up Portland and has character. There is a lot of exposed red brick in the walls and the hardwood floor looks like it has been walked on for a hundred years without being refinished. The espressos are top-quality and they change frequently so it’s like an espresso treasure hunt to go there and see what they are serving. If you are just walking by, you might not think much of Coffeehouse Northwest, but step inside and you won’t be disappointed.